in a sentence or two: Catherine Morland has been sheltered from the inner workings of the social mechanics of the world...but that all changes when she heads to Bath. Catherine meets many new people and deals with many awkward social encounters (even an accidental engagement proposal) - all before heading to a gothic castle with her new bestie and crush! Catherine is caught somewhere between naive and sheltered when it comes to her personality. however, it is that lack of social bite and mischief that keeps her amazingly charming and sweet. she is sent to Bath from her loving family with her neighbors in order to get out and be a part of society (she's already 17 after all!). while there she meets Isabella whom the reader can tell from first go is a bit of a wishy-washy / "say anything to get what i want" kinda gal...but of course catherine only sees a loving companion. their time together in bath was so enjoyable to read, especially from a female perspective, because the actions of Isabella are (unfortunately) still alive and kickin' today. there are many fun and flirty exchanges between Henry Tilney and Catherine when they first meet, and many many more thereafter. it makes you giggle imagining the sweet and innocent Catherine unknowingly flirting while Henry teases her and falls in love all the while. where the romance forges ahead is when she heads to northanger abbey - the gothic castle. she's a mystery genre book lover (austen giving the shout out to all us nerdos out here!) and is especially intrigued by the abbey. there is a good deal of mystery and intrigue, but mostly to satisfy catherine in a wink and a nod sort of way for the reader. 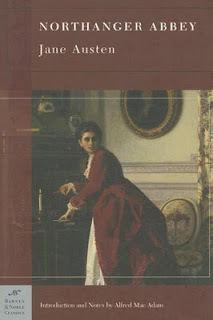 i LOVE Jane Austen, so of course i have somewhat of a biased opinion about this one. however, i did like how the portrayal of female friendships in this novel took off - and how true they still are today. the mysteries of the abbey were fun to read because the reader got sucked in almost as much as Catherine already was with the dark corners and raging storms! the subtle love of Henry and Catherine almost serves as a background to the mystery and social commentary, so if you're looking for a blowout romance - not here. however, if you're looking for a fun read on the relationships between men and women, women and women, and many painfully awkward social encounters (SO FUN), then read this, you'll like it. fix er up: it's jane austen. what is there to fix?